After Lotherton Hall was passed to the citizens of Leeds by Sir Alvery Gascoigne, furniture that had originally been at Parlington Hall was distributed between Lotherton and Temple Newsam, for over ten years Christopher Gilbert [Principle Keeper of Temple Newsam] catalogued the entire collection and produced the definitive work on elite English 18th Century firniture. I hope to be able to present his work in the context of its original location Parlington Hall. The first such piece is the table shown at the head of this page, I referred to it in my recent post about my talk at Lotherton Hall. The piece was scheduled in the 1905 Valuation as follows. Extract from the valuation done by Hollis & Webb. Two fibre door mats. Axminster rug. Large Turkey carpet old. 9 mahogany chairs in leather. 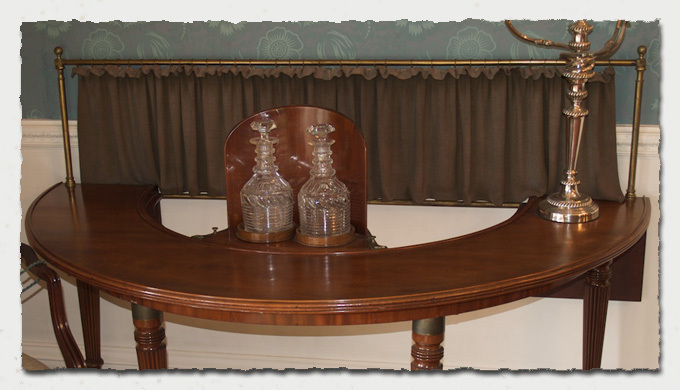 Mahogany half circular serving table with brass rod & curtain at back. Rosewood tea caddy & bottles. Photo frame. Six bronze gas brackets & globes. Copper coal vase. Steel & iron fender, plate stand & implements. 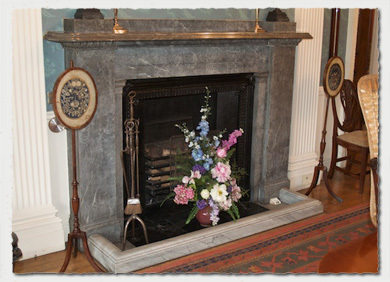 Marble mantel suite of clock & pair of side ornaments. Wood stand Old Turkey hearthrug. Reflecting lamp. Walnut writing table. Stationary cabinet. Small oak ditto. Debretts Peerage &c 1887. Pen tray & writing materials. 2 tier dumb waiter. Waste paper basket. Mahogany & 3 fold screen with wool work panels. Mahogany firescreen with glazed & movable panels. Pair of crimson cloth curtains valance & cornice. 3 blinds. Stand for parrots cage & linoneum. Music stool. Pianola. Old long grand pianoforte by Broadwood. Two seals. Carved wood tray. Small birch stand inlaid top. Hammered iron stand fitted with copper kettles & tea service. Mahogany two tier dumb waiter.. 16 tunes of pianola. 8ft 6 mahogany pedestal sideboard. A ditto ditto. Metal model of a sailing boat on stand under glass shade. Two liqueur cabinets. Mahogany musical box. Mahogany side table. 6 fold screen with painted panels. Butler's tray stand. 3 decorated tray's. Pair decorated vases. Two electro plated wine coolers. Mahogany wine cooler on carved feet. Mahogany bottle stand. Antique mahogany extending dining table. 4 mahogany arm chairs with seats in leather. Small spirit cask with tap. Bronze gasalier. 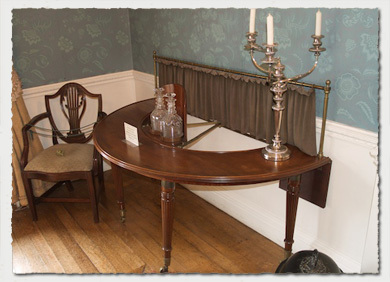 The picture shows the table in its present location in the Dining Room at Lotherton Hall. The piece, known as a Wine or Social Table, was an after dinner gathering point for the gentlemen to relax in front of a fire and to enjoy a fine port, hence the decanters. There is a mechanism to rotate the platform on which the decanters sit to enable the visitors to help themselves to further refreshments, rather in the style of the rotating food carousels found in chinese restaurants. All the time being radiated with heat from the fire on to their legs and groins, very healthy, I don't think. There are two hinged end flaps on the half circle, around a foot in length supported on lopers, [Wooden struts which extend from the underside the table top, to support the hinged panel in a level position, commonly used on drop leaf tables] which would have distanced the people seated at the table from the fire, the baize curtain, would have prevented the fire from scorching the faces of those imbibing the port at the table, similarly the decanters sit on a tray with a rear curved heat shield. Wine or social tables were intended for after dinner drinking in front of a fire; the party seated in a semi-circle around the table, were screened from undue heat by the curtain, while the shield on the decanter trolley protected the port as it coasted around the table. Gillows' packing book, p.162 records that case 7 despatched on 17 Oct, 1810 contained "A mahogany social table with mahogany bottle screen" Provenance: R. O. Gascoigne; recorded in the Parlington inventory 1843 "1 mahogany horseshoe table and curtain" Lotherton Hall; the Gascoigne gift 1970. Clearly the valuer in 1905 was unaware of the purpose of the table, as it was described as a "serving table", which suggests that as it would have been in-situ at the time of the valuation, in the Dining Room, we can reasonably predict that it was, like it is today at Lotherton, not in front of a fireplace, and since that the fireplace at Lotherton is from Parlington, we can also reasonably assume that this may have been the one from the Dining Room. A Regency carved mahogany Cellarette in a coming Bonhams Auction.